Well, I meant to write this at the end of last week…but you know how things go. So now we have two weeks of school under our belts and I shall give you a recap. This is the first year the kids have really been old enough to do something “serious” which is a little intimidating but still in the fun stages. I’m trying to keep it simple and am focusing on the “3 R’s” as far as formal schooling is concerned. 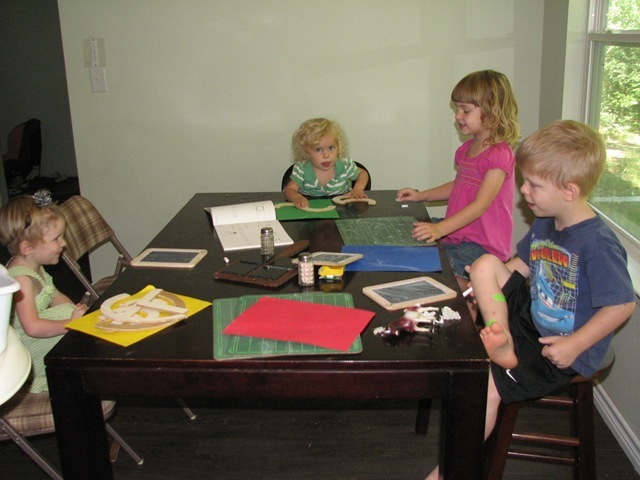 Anything else they learn will be part of life and they won’t know they are being schooled (sneaky mom, I know). 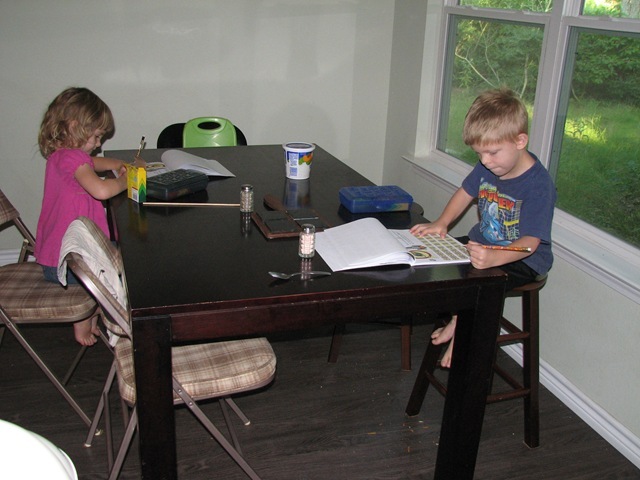 As my sister heard at a conference “teaching a chore is preparing a child for life and counts as school.” This is good news for me since it takes about two hours to get everyone from wake up through barn breakfast and chores – but more on that in another post. 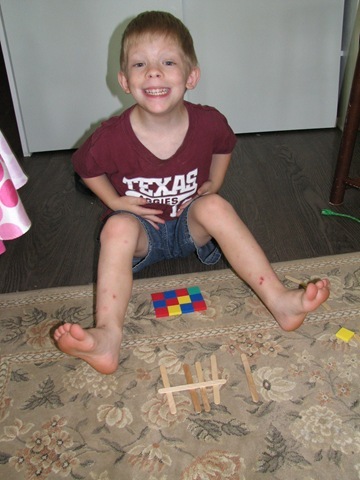 Lance demonstrates counting with tally sticks. 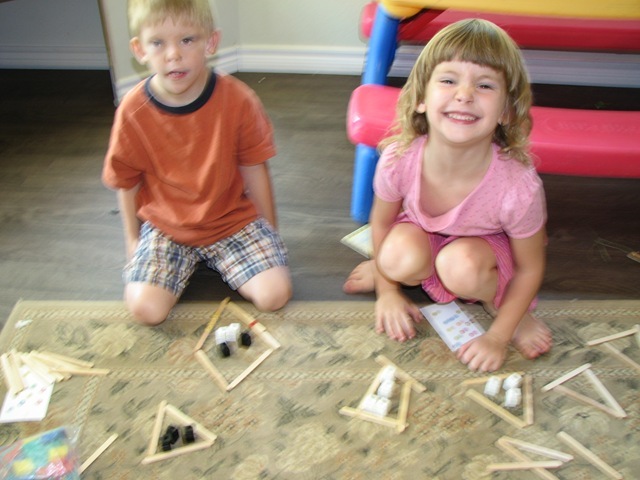 Math is in the morning since it was easiest to include the little ones (playing with the manipulatives). We’re using a method of teaching math concepts in a way I’ve not seen before but I’m really liking it. Easy to teach and pretty fun for the kids. If I get frustrated trying to teach a concept then it’s supposed to signal a change on my part. So far this has happened while teaching “ordinal counting” (numbering 1st through 5th – don’t worry, I didn’t know it was called that either). 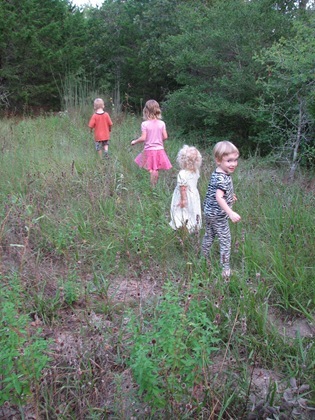 Anyhow, I took them all outside, staged a race, handed out place “ribbons” then played follow the leader in that order. I think they got the idea. Reinforcing the idea that triangles have three sides and quadrilaterals have four by penning the right amount of “sheep” in each. Sorry for the blur. 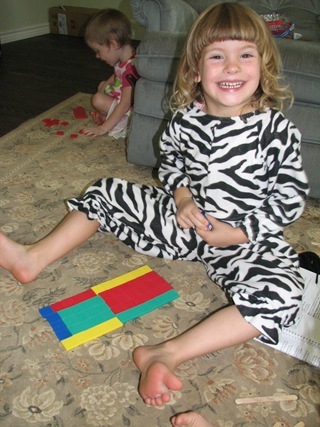 The perks of home school – math class in zebra costume! (and nobody even bats an eye). 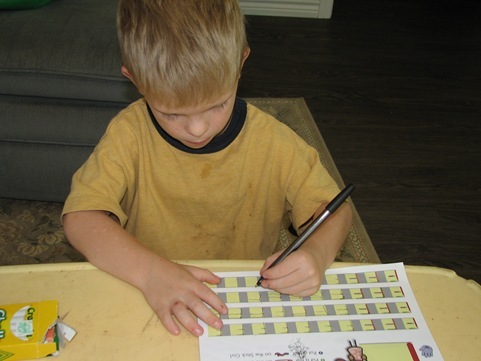 While he is much slower at writing (an “ambi” turning leftie) he portrayed the tortoise, lapped his sister “the hare” and on Monday he finished his book first! Phonics proves a bit harder for me to muster enthusiasm but I made up a short vowel game that managed to create some excitement. 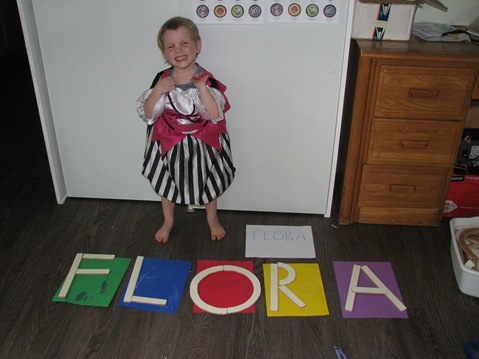 Poor Flora knows her stuff, just needs to be a little quicker for a decisive win. As a reward for finishing phonics I’m letting the older two finally use the computer. I stumbled across a program that teaches mouse and keyboard skills while reinforcing the handwriting teaching style that I use. It is called “Keyboarding without tears” which unfortunately is false advertising. Using a mouse is harder than it looks and both have broken down with frustration when they couldn’t get the piece where it is supposed to go. 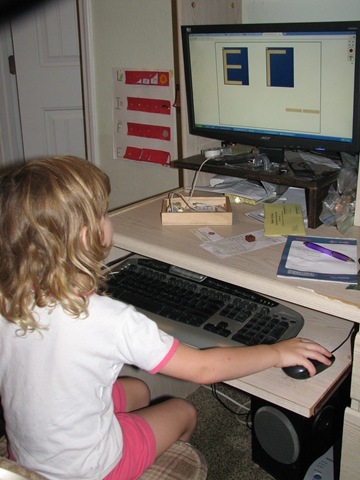 However, the desire to use “mom’s computer” (previously off limits) overcomes the difficulty and I’m sure in a few weeks they will have the hang of things. 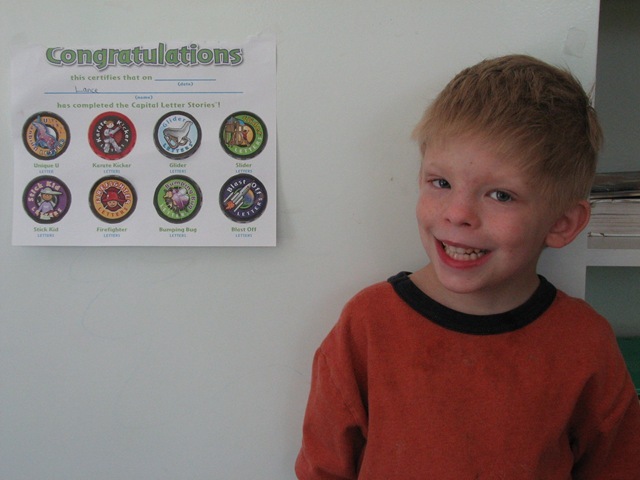 At the risk of getting too wordy I want to encourage moms out there who might see these few pictures and imagine the “perfect” little school I have going. But remember, you’re seeing only what struck me as so fun I had to go grab the camera. 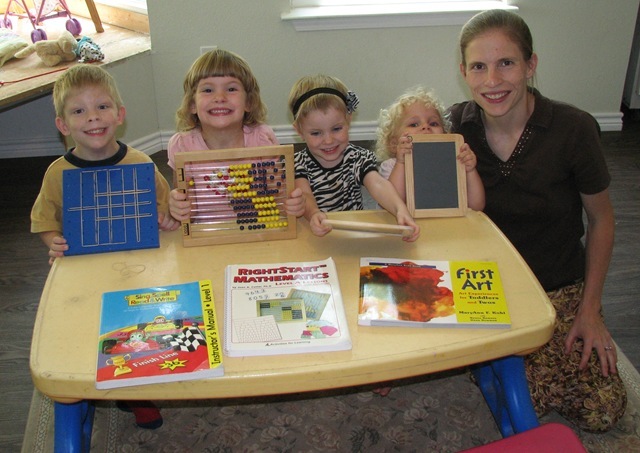 We have mornings of chaos, potty accidents, fussy babies, attitudes and training – but all of that is school too! While Monday we were ready to start an hour early, by Thursday life had caught up and we started about 15 min late and nobody really paid attention. I had to figure out whether to follow enthusiasm over letter writing or let schedule dictate and do math class, watching the zealous writer glaze over, mind elsewhere. I stumble, fall, and try again while the kids give me grace. I seek out experience from my mom, ask my husband for advice and most of all, find myself coming to the Lord for help – and that’s what really counts in all of this. If my kids catch one thing I hope it’s a zeal for the Lord and a dependence on Him when things are tough or fun or complicated. 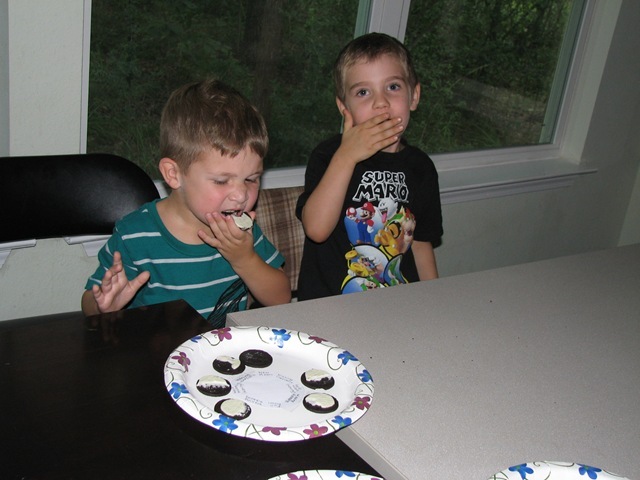 So whether it’s learning moon phases with cookies (our co-op)…. Or going out to see the trail they made with Aunt Katie I want life to be school because school should prepare them for life. Looks like fun! I can’t wait to start doing school with my children. Right now I am enjoying doing projects with Greg while he is still the only one. Keep plugging away! Hey, the chore stuff is worth it. The girls actually saved me time by helping with the dishwasher the other day! Great post. In this day of amazing-mom computer blogs, I like your statement, “But remember, you’re seeing only what struck me as so fun I had to go grab the camera. We have mornings of chaos, potty accidents, fussy babies,etc.” These special times are what you will remember as potty accidents fade into oblivion (well, most of them). I’m sure you’ll do fine. You had a great teacher and you were an apt pupil. Fabulous school and yet, life is a school. When we stop learning, at any age, then we stop living. Way to go Amy and you are doing great.